Are you in the market for recyclable, eco-friendly and sustainable coffee pods that also happen to be mouthwateringly delicious and on sale? You’ve come to the right place! Coffee Cow is offering 10% of all Wolfgang Puck soft coffee pods for a limited time only. 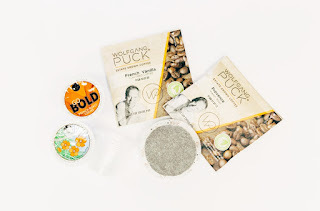 With flavors like Provence French Roast, Jamaican Me Crazy, South Pacific Dark Fair Trade and classic French Vanilla, Coffee Cow’s variety of Wolfgang Puck coffee pods won’t disappoint. Coffee Cow’s Wolfgang Puck sale arrives just in time for Earth Day, and what better way to celebrate this holiday than to do our part to keep our planet clean and help end pollution. By purchasing Wolfgang Puck’s soft coffee pods, you’re pulling double duty by enjoying delicious coffee while helping the environment. Wolfgang Puck pods are earth friendly from bean to cup. Estate-grown Arabica coffee is ethically sourced from sustainable plantations, and then the beans are roasted in a plant powered by 100% renewable energy. Once brewed, your used pods are 100% compostable. For a limited time, all Wolfgang Puck soft coffee pods will be 10% off (discount already applied -no coupon code necessary)! For those who want the best coffee by any beans necessary, shop Coffee Cow.